The previous pAsuram mentioned about the partiality that emperumAn shows towards his followers. emperumAn asks AzhwAr “is there such a partiality in me? I have not known of such partiality within me”. AzhwAr responds through this pAsuram “if it weren’t there, did the rage that you showed against iraNiyan (hiraNya kashyap) an act?”. Did you show your anger because he was an apt enemy for you? In the previous pAsuram, emperumAn’s quality of vAthsalyam (motherly love) was mentioned. This pAsuram mentions the rage born out of that vAthsalyam. nI vAy maduththadhu en – why did you fold your tongue? vayiRu azhala vAL uruvi vandhAnai – after seeing the way iraNiyan came wielding his sword, emeprumAn’s followers were grieving as to what harm will befall him. Just as thirumangai AzhwAr says in periya thirumozhi 5-7-5 “enganE uyvar dhAnavar ninaiththAl” (how will the demons sustain themselves when they think [of what happened to hiraNya kashyap]? ), emperumAn’s followers also were afraid after seeing the divine form of narasimha (combination of lion face and human torso). vayiRu azhala – to grieve with sorrow. Who is grieving with sorrow? It is AzhwAr. AzhwAr is thinking that iraNiyan is wielding his sword now, against narasimha, instead of thinking that he had done like that several yugas (eons) back. This is similar to periyAzhwAr saying with the emotional stance of yaSOdhA in periyAzhwAr thirumozhi 3-3-7 “enRum en piLLaikkuth thImai seyvArgaL anganam AvArgaLE” (those who harm my son (krishNa) will suffer the same way). This is also similar to sugrIva telling SrI rAma in SrI rAmAyaNam yudhdha kANdam 17-5 “asmAn hanthum na samSaya:” (without doubt he (vibhIshaNa) has come only to kill us” [such is their fear for the safety of emperumAn]. anja eyiRu ilaga vAy maduththadhu en nI – why did you fold you tongue to display your teeth, in such a way that iraNiyan was scared? Isn’t this ostentatious laughter appearing sweet to pirAttis (consorts of emperumAn) also? This act has not been done because there was no other way! This laughter, with your teeth visible, is more liked by pirAttimArs than the gentle smile that you show when you are together with them. pU vadivai Idu azhiththa pon Azhik kaiyA – Oh emperumAn who are holding in your hand, the divine disc which has won over even flowers by its softness and beauty! The word ponnAzhi could also be construed to refer to the special ring on his hand. eyiRu ilaga vAy madiththadhu en nI – why did you fold your tongue and remain angry without controlling it, even after killing iraNiyan with your divine nails, instead of killing him either through your vow or through your divine disc? Isn’t the reason for this due to your love for your devotee prahlAdha! Even after killing iraNiyan, didn’t you take your own time to reduce your rage! emperumAn himself remains in a way similar to that mentioned by SrI rAma in SrI rAmAyaNam yudhdha kANdam 114-10 “maraNAnthAni vairANi” (enmity ceases with the occurrence of death). When a danger befell his follower sugrIva in SrI rAmAyaNam yudhdha kAndam 41-4 did he not say “thvayi kinchith samApannE kim kAryam sIthayA mama” (what is the benefit for me with sIthA if any danger comes your way)? The term vAthsalyam does not refer to the cow suckling its calf. It is pushing out its earlier born calf with its horn, in order to protect the calf that it gave birth to on that day! Just as thirumangai AzhwAr mentioned in periya thirumozhi 5-8-3 “koNda sIRRam uNduLadhu” (there is an anger that you took upon yourself), it is this rage that he takes against his enemies which provides the refuge to his followers when his followers are threatened. 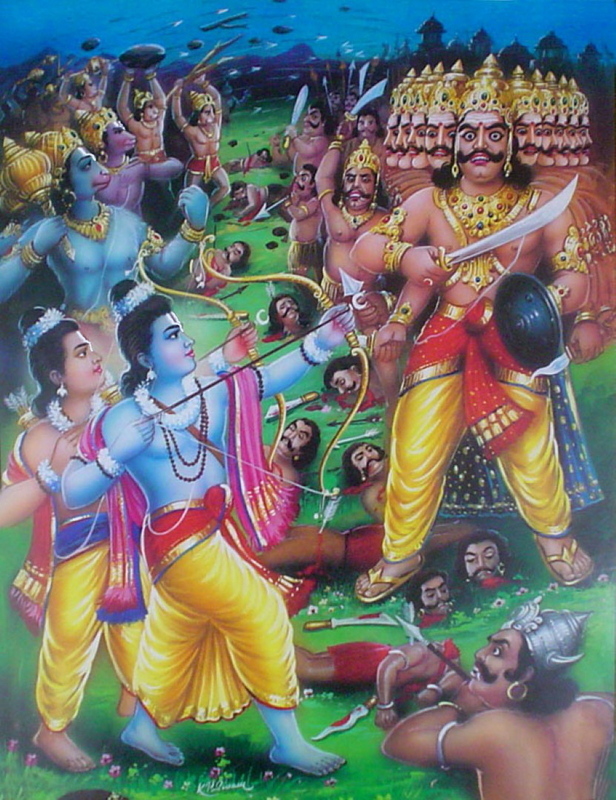 Is there any limit to the rage that SrI rAma had when his devotee hanuman was injured by rAvaNa when rAvaNa shot his arrows? SrI rAmAyaNam yudhdha kANdam describes this in its SlOka 59-136 “thathO rAmO mahA thEjA:” (SrI rAma was radiant then). rAvaNa who was looking at this could not look SrI rAma in his face. Is it possible to control an ocean if it starts burning? “rAvaNEna krutham vraNam” (the injury created by rAvaNa) – rAvaNa created an insignificant problem for hanuman as much as a mosquito will create for a lion. Is this injury (created by rAvaNa) anywhere near that which hanuman experienced when he tried to pluck sun thinking that it was a fruit, when he was wandering in the sky? SrI rAma became angry because he could not tolerate even this small injury to his follower hanuman. “dhrustvA kOpasya vaSamEyivAn” (on seeing, he came under the control of anger). After seeing the injury to hanuman, SrI rAma could not be seen. He forgot himself. He forgot hanuman. hanuman had earlier said “na rAvaNa sahasram mE” (even if a thousand rAvaNas come, they cannot equal me). But rAma thought of hanuman as a monkey [and not as a mighty warrior when rAvaNa showered his arrows on hanuman]. “kOpaysa vaSamEyivAn” (he came under the control of anger). Just as hanuman appeared to lose to someone who is not his equal, SrI rAma lost to his anger which was not up to his standard. It was that SrI rAma who became enraged who was described as in SrI rAmAyaNam ayOdhyA kANdam 20-4 “nakrudhyathyapiSabdhOpi krOdhanIyAni varjayan” (since he avoids giving space for anger, even if he is abused he does not become angry) and as said in SrI rAmAyaNam ayOdhyA kANdam 1-10 “sa cha nithyam prASAnthAthmA mrudhupUrvam cha bhAshathE uchyamAnOpi parusham nOththaram prathipadhyathE ” (always having a soft heart, he talks softly. Even if others use harsh words, he does not respond to that)! We shall take up the 94th pAsuram next. This entry was posted in iyaRpA, mudhal thiruvandhAdhi on September 12, 2017 by T N Krishnan.